Various letters and articles in the North Wales Daily Post forced me to write to Mr Brunstrom again... Will we ever get a worthwhile answer? Our letter above appeared in the Daily Post on 7th August 2003. We wrote to Mr Brunstrom in case he had missed the final vital question. You still have not replied to my letter of 30th May 2003. I expect you to provide an accurate answer to that exact question, with proper references to back it up. Since you are personally responsible for a road safety policy based on speed enforcement, I think it will reflect extremely badly on you if you do not provide a plain and verifiable answer. On the 14th August, another of our letters was printed in the Daily Post (click here). We wrote to Mr Brunstrom again. You still have not replied to my letters of 30th May 2003 and 8th August 2003. What are the figures for the first six months of 2003? I expect you to provide the figures for fatal and serious casualties on all North Wales roads for the period 1.1.2003 until 30.6.2003. 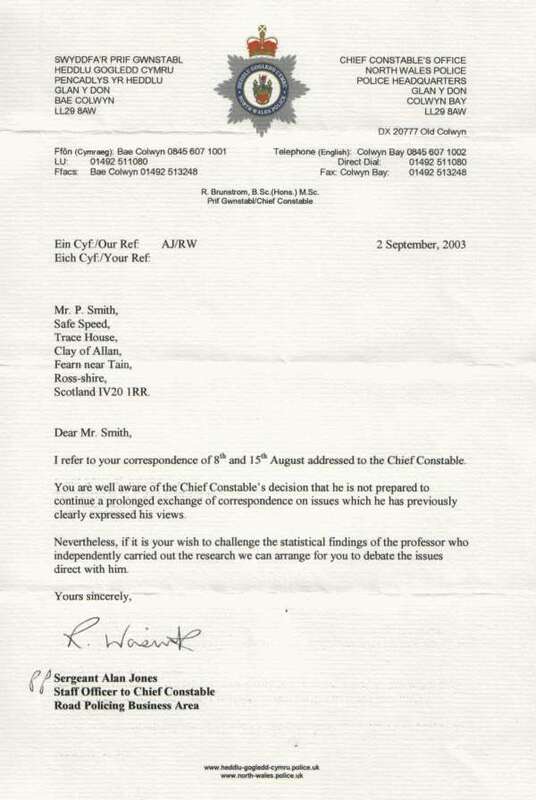 I have received a letter dated 2nd September 2003 from Sergeant Alan Jones. Contrary to Sergeant Jones’ suggestion, I have no desire whatsoever to enter into “prolonged correspondence”. All I seek are simple, straightforward answers to simple straightforward questions. If you don’t have answers, then please have the decency and the common courtesy to say so. These questions are central to your roads policing policy and the public deserves proper answers. 1) What proportion of a whole year’s KSI accidents have been in the first six months of recent years in North Wales? We need this figure to better estimate the first six month’s road safety performance in the context of previous years. Better yet would be casualty figures by month for the past 7 years. I do not mind doing the analysis. 2) How do you explain the (apparently) significant increase in serious accidents despite massively increased speed enforcement on North Wales Roads? Sergeant Jones offers me the chance to discuss “statistical findings” with “the professor who carried out the research” – I am delighted to accept this offer, thank you. Please put me in touch.